Johannesburg (Agenzia Fides) - The young representatives of seven countries of southern Africa gathered to reflect on the conclusions of the Synod of Bishops in October, on Young People, Faith and Vocational Discernment, and above all to offer concrete indications and suggestions to the respective Episcopal Conferences, so that the Synod can be realized in their communities and in the entire South African region. According to information sent to Agenzia Fides by Fr. Dumisani Vilakati, of the IMBISA Pastoral Department, the event took place from 5 to 8 March, on the initiative of IMBISA (Inter-Regional Meeting of the Bishops of Southern Africa). Those present among the youth included Josias from Lesotho, Petrina from Namibia, Felippe from Mozambique, Koketso representing Botswana, ESwatini and South Africa and Tendai from Zimbabwe. The workshop was facilitated by Mr. Mike Greef, an associate of the Marist Brothers. The discussion, as reported by Fr. Vilakati, revealed the hunger for young people to have constant contact and communication among themselves. The idea of having a large gathering of youth, akin to World Youth Days, was mooted as a forum for faith sharing in the region. Catch phrases were: "We want an IMBISA Youth Day" or "We want an IMBISA Youth working group". Bishop Sephamola Mopeli OMI of Qasha’s Neck in Lesotho, who is responsible for the Pastoral Department of IMBISA, was quietly following all the discussions at the workshop. At the end of the workshop he expressed his desire that the Synod on young people may become a true flame of hope in the communities where young people find themselves. He also expressed his joy at seeing young and intelligent Catholics showing interest in such an important activity of the Church. IMBISA had already, last July, hosted a Pre-Synod workshop for Bishops, Priests and young people. 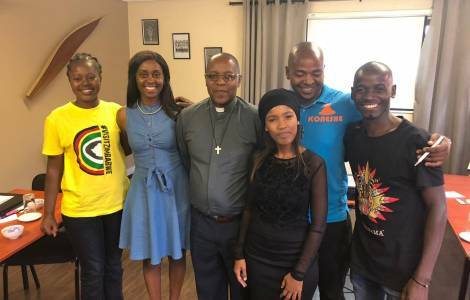 Moreover, some of the young people had themselves attended the Pre-Synod meeting in Rome which took place in March 2018 and the one organised by IMBISA, being present in the Synod itself as well as attending the last World Youth Day in Panama. As such it can be observed that some young people have a lot of experience working in the Church. It is hoped that this great energy and enthusiasm can be used profitably for the advancement of the mission of the Church.